Followers of this column would recall that I spent the past two weeks discussing prevailing reporting standards for financial statements and how they can, at times, make it more difficult to determine the underlying fundamentals of a company. Most financial statements do contain useful information, though not necessarily all that the company is willing to provide. But some information, even when it is in compliance with all accounting standards, can be misleading. Case in point, the situation surrounding financially troubled Hyflux (listed on the Singapore Exchange), which I discussed in detail last week. To recap, part of its recognised profits do not entail cash flow and certain obligations (perpetual securities classified as equity) are reflected in a way that overstates profits and understates gearing. If there is one thing to be learnt from the Hyflux saga, in which stakeholders are now facing significant losses, it is that even well-regarded companies can and do fail under the burden of debt. This being the case, we undertook an exercise to look at all the companies listed on Bursa Malaysia (excluding financial institutions and real estate investment trusts). 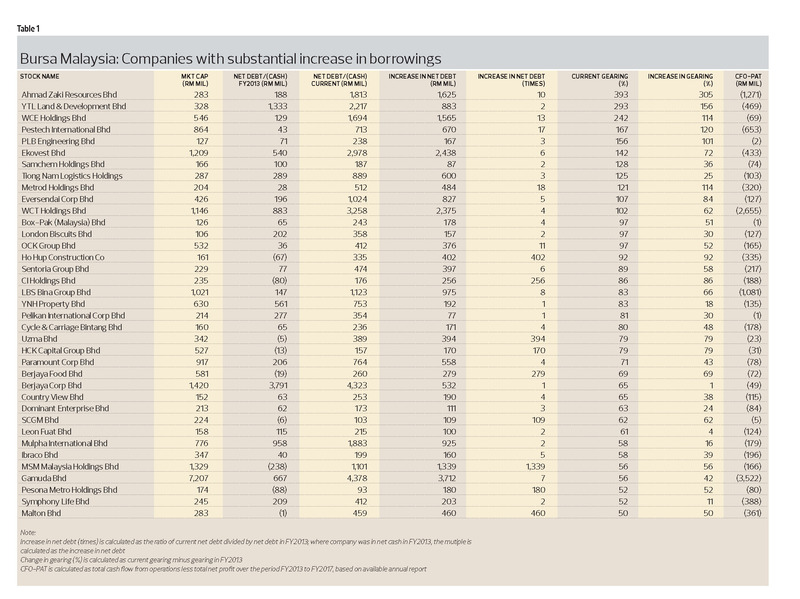 Of the 877 companies, there are 319 that reported an increase in net absolute borrowings since FY2013. We omitted companies with market capitalisation below RM100 million ($33.2 million) and added several additional filters to the remaining 217 companies. First, we left out companies where gearing levels are now lower than they were in FY2013, even though the absolute amount of borrowings has increased. Why? 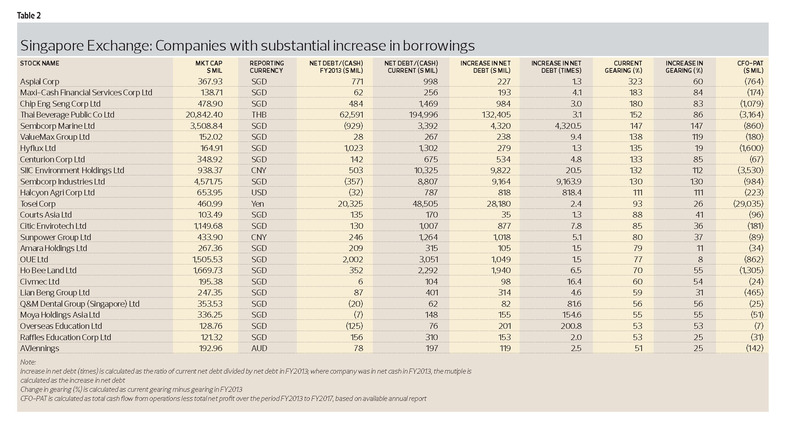 These companies have also raised equity (accumulated profits) and increased their assets faster than borrowings. Next, we eliminated those whose cumulative cash flow from operations is higher than net profit over the period FY2013 to FY2017. We decided on this filter to remove companies that generate strong cash flow, such as telcos. Finally, we whittled down the list to only companies whose current net gearing is more than 50% to reflect the relatively higher risk profile. The result is shown in Table 1. 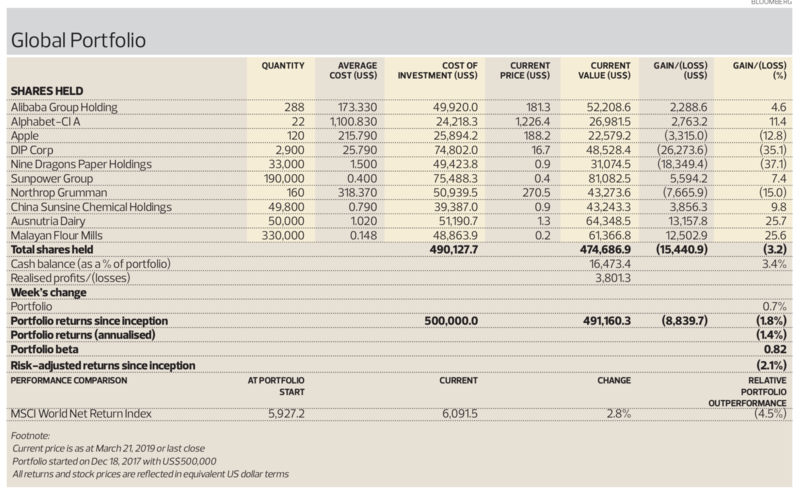 We repeated the exact same exercise for companies listed on the Singapore Exchange (see Table 2). Let me be clear, we are not saying these companies are, or will be, in financial difficulties. Companies necessarily reinvest for the future. These expansions are funded through a combination of internally generated funds, borrowings and cash calls. The capital investments then generate future income streams, to pay off the debts and reward shareholders via dividends. What we do wish to highlight are the risks associated with high gearing and that investors should take a deeper dive into their financials to make the best-informed decision. As in the Hyflux case, one may well have come to a different investment decision with a better appreciation of the accounting behind its reported numbers. 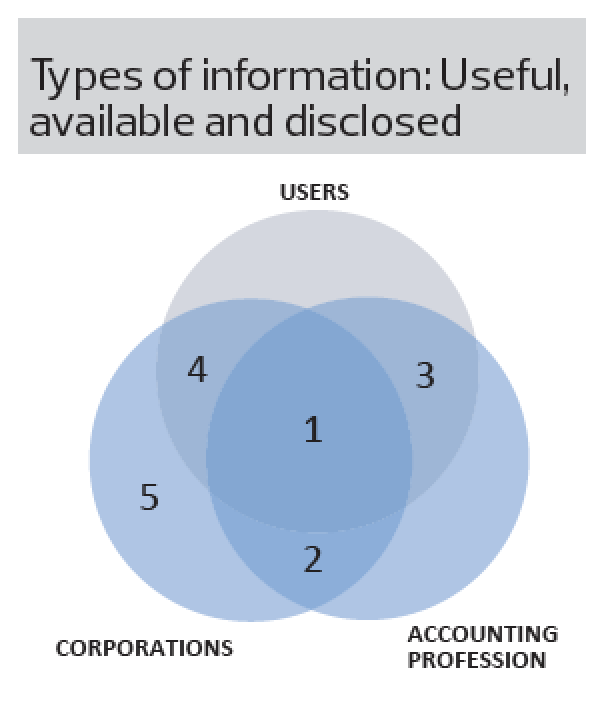 Incidentally, these details are what I meant by useful information companies are willing to disclose but which are not contained in financial statements — in quadrant 4 of the diagram (which I articulated two weeks back). The Global Portfolio gained 0.7% last week, which pared total portfolio losses (since inception) to just 1.8%. Nevertheless, this portfolio is still underperforming the benchmark MSCI World Net Return Index, which is up 2.8% over the same period. Disclaimer: This is a personal portfolio for information purposes only and does not constitute a recommendation or solicitation or expression of views to influence readers to buy/sell stocks, including the particular stocks mentioned herein. It does not take into account an individual investor’s particular financial situation, investment objectives, investment horizon, risk profile and/or risk preference. Our shareholders, directors and employees may have positions in or may be materially interested in any of the stocks. We may also have or have had dealings with or may provide or have provided content services to the companies mentioned in the reports.